Embroidered book cover for Henshaw’s Horae Successivae (1632), white satin with a floral design edged in gold cord, featured in Cyril Davenport’s English Embroidered Book-bindings (1899) — Source. Initially a sixteenth- and seventeenth-century practice of decorative embroidery on religious texts or presentation copies for royalty, embroidered books were a lavish alternative to leather bindings that allowed for the individualized ornamentation of bookish exteriors. This practice of ornamented bookbinding enjoyed a surge of popularity as a handicraft in the nineteenth century. In a variety of publications, from magazines to histories of bookbinding and collecting, middle-class Englishwomen were encouraged to ply their needles within an explicitly patriotic historical tradition. The British Museum acquired a number of early modern embroidered books in the initial bequest of the Old Royal Library by George II in 1757, shortly after its founding. At the end of the nineteenth century, innovations in photography and printing allowed that collection, as well as select examples held at other British institutions such as the Bodleian and the South Kensington Museum, to be reproduced in book form and introduced to a broader readership. The first to treat the embroidered book individually was Cyril Davenport’s English Embroidered Book-bindings, published in 1899 as part of a series titled The English Bookman’s Library. Davenport’s volume reproduces images of fifty-two books, some in color but most in half-tint black and white. The plates and their accompanying descriptions are organized first according to fabric type — canvas, velvet, or satin — and then chronologically. Working from original photographs, Davenport tinted some and added embellishments to others for better visual effect. One color print is of a beautiful copy of Christopherson’s Historia Ecclesiastica, owned by Queen Elizabeth I. The three volumes are bound in matching deep green velvet and are delicately embroidered with the royal coat of arms, Tudor and York roses, and a scattered field of small pearls. A colored photograph of one volume serves as the frontispiece to Davenport’s book, and he admits to doctoring the photograph in order to restore some of the missing pearls. 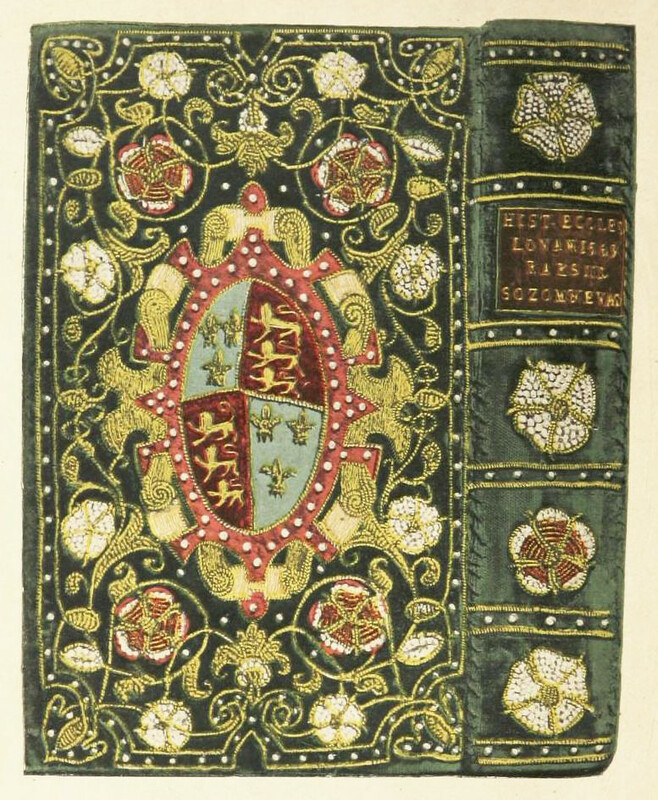 Christopherson’s Historia Ecclesiastica, owned by Queen Elizabeth, featured as frontispiece to Cyril Davenport’s English Embroidered Book-bindings (1899) — Source. The English Bookman’s Library represents a body of late-Victorian book-historical writing that is invested in reproducing and displaying the holdings of national institutional libraries as both collectibles and as models for the contemporary fine press movement. The short series, which also included H. R. Plomer’s A Short History of English Printing (1900), and W. Y. Fletcher’s English Book Collectors (1902), emphasized a historical trajectory that culminated in the work of presses such as William Morris’ Kelmscott Press, best known for producing elaborate editions inspired by illuminated manuscripts. As series editor Alfred W. Pollard writes in his “General Introduction”, this is a “new series of books about books, exclusively English in its aims”, and seeks to fill in the gaps of book history at a time when, as he “boldly” says, “the book-work turned out . . . by the five or six leading printers of England and Scotland seems to [Pollard], in both technical qualities and the excellence of taste, the finest in the world”.3 In other words, the series is intended to shore up this claim of primacy in modern fine press printing. 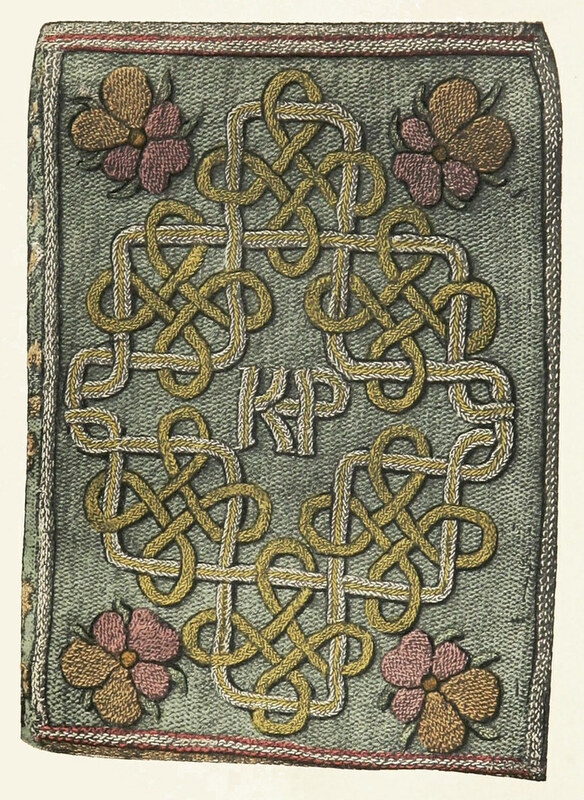 However, Davenport’s entry on embroidered bindings is unique in its explicit invitation to women to participate in their revitalization. “Douce” Bible (1583) owned by Queen Elisabeth and bound in crimson velvet, featured in Cyril Davenport’s English Embroidered Book-bindings (1899) — Source. 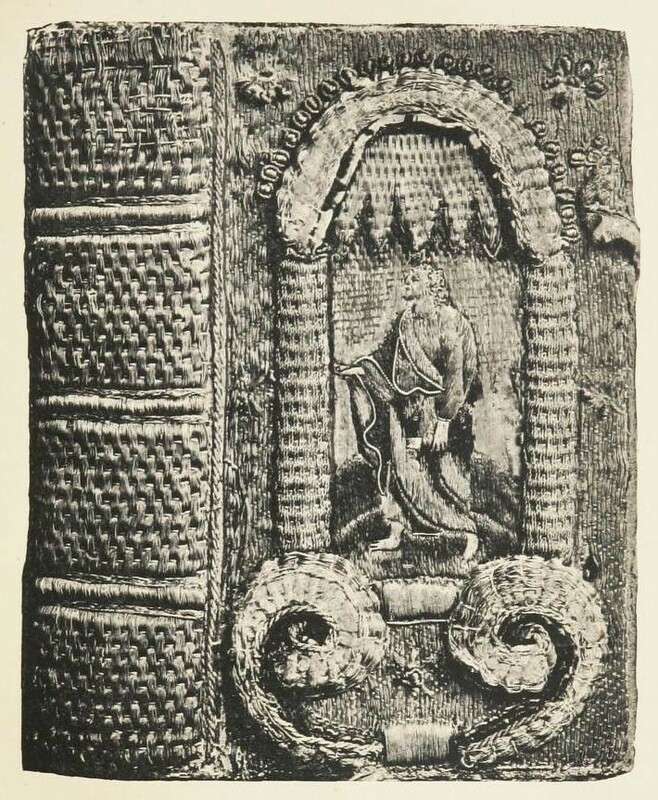 Bible printed in London (1626) bound in canvas and embroidered in coloured silks and silver threads, depicting the figure of St Peter, featured in Cyril Davenport’s English Embroidered Book-bindings (1899) — Source. “Fancy-work”, or domestic handicrafts from flower pressing to needlework, flourished during the nineteenth century as a rapidly growing middle class relegated more and more women to exclusively domestic spaces. The products populated the famously cluttered Victorian sitting room: embroidered pillows and footstools, embroidered accessories and furnishings, terrariums, and taxidermy on display. However, for many women, embroidery and other crafts were also a source of supplementary income. Crafts were sold and exchanged at local markets and charity bazaars; other times embroidery work was outsourced to women working from home, creating a silent workforce. Needlework also served as a mode of personal and artistic expression that often inhabited the social spaces of the home, circulating in surprising ways. Psalms (1633) from London, measuring just 4 x 3 inches and bound in embroidered white satin, featured in Cyril Davenport’s English Embroidered Book-bindings (1899) — Source. 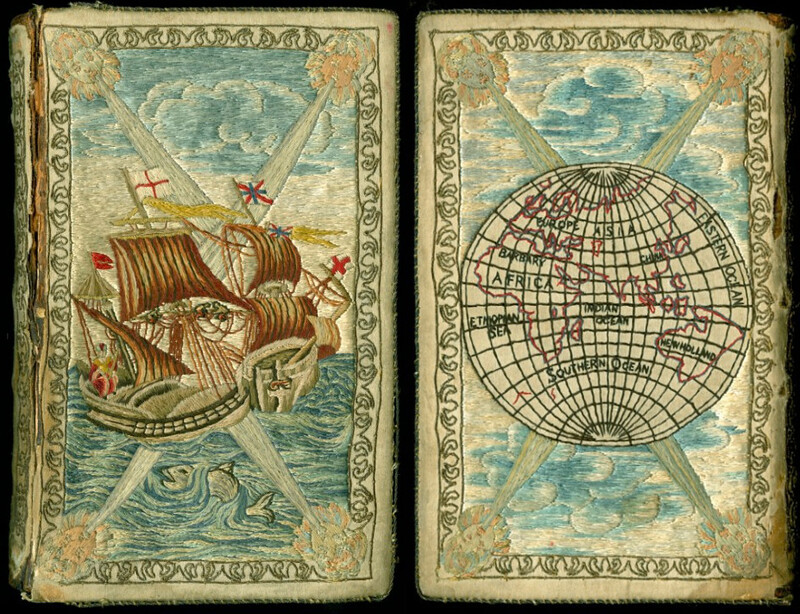 Embroidered front and back covers of a 1791 edition of Robinson Crusoe, from the Newberry Library — Source. 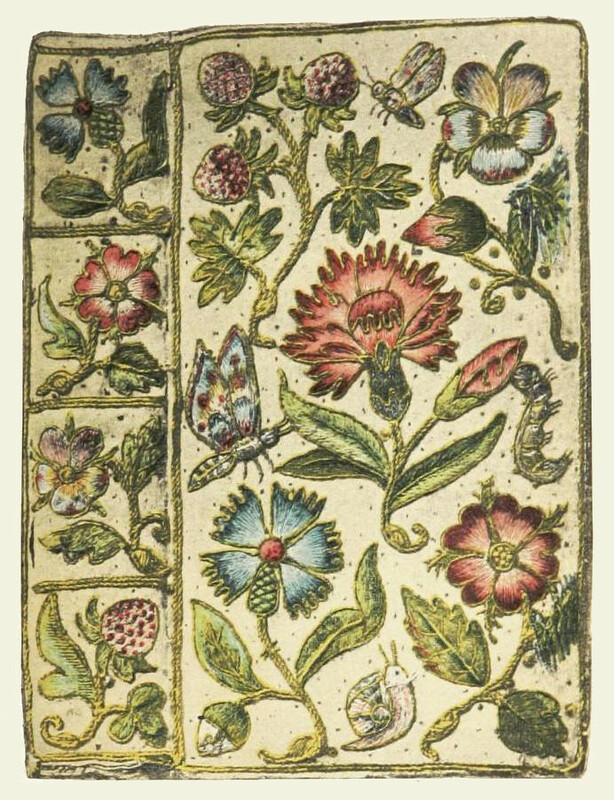 In this framework book-embroidery requires intellectual engagement with a text, and careful attention to the historical examples which, Davenport claims, can be “advantageously studied” by interested craftswomen.8 The embroidered book thus offered Victorian women a unique surface for bridging handicraft and literary history. Moreover, Davenport consistently couches his descriptions of the bindings in their connection to English institutions and historical figures, revealing a persistent thread of patriotic historicism. In taking up book -embroidery, the average middle-class Englishwoman joined the company of queens. One of Davenport’s chief examples is a manuscript of The Miroir or Glasse of the Synneful Soul, copied out by the hand of then-Princess Elizabeth and potentially covered and decorated by her as well. The manuscript was a gift to her stepmother, Katherine Parr, and features the queen’s initials surrounded by hearts-ease flowers. Davenport writes this book into a patriotic domestic history that blends writing and embroidery, emphasizing the relatively amateur quality of the work — not likely to be the work of a hired professional — which aligns with expectations of amateur expertise applied to Victorian women’s needlework. Embroidered cover to Princess Elizabeth’s copy of The Miroir or Glasse of the Synneful Soul, copied out in her her own hand when just 11 years old, featured in Cyril Davenport’s English Embroidered Book-bindings (1899) — Source. The book’s embroidery is also attributed to the queen. On both covers are legends in Latin, surrounded by gold cord. Davenport acknowledges that, like the previous example, there is no absolute proof of the queen’s hand in making the cover. However, he argues, its simplicity points to it being of amateur, rather than professional, origin. Including Elizabeth’s meditation on reading with her books reinforces a national history bound up in reading, writing, and embroidery. It also illuminates a late nineteenth-century urge to express emotion through that same entanglement of the written word and material culture. 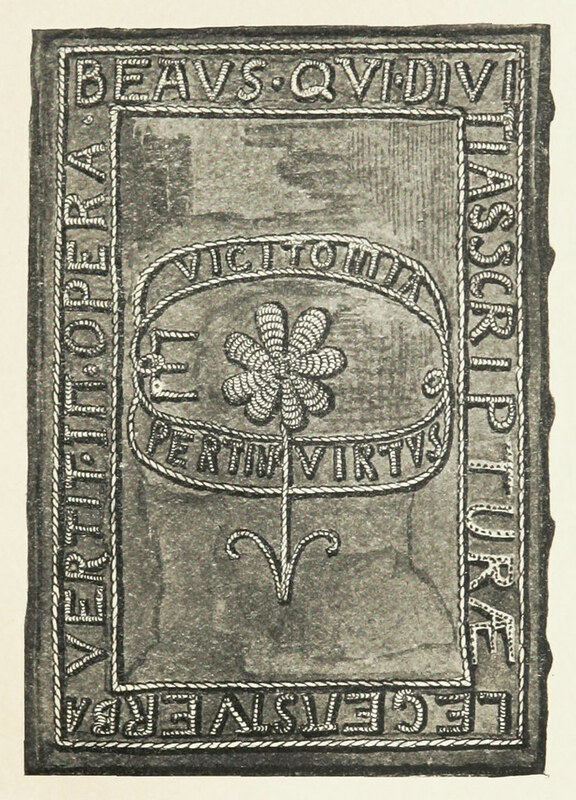 Embroidered cover to a 1578 edition of The Epistles of St. Paul, owned by Queen Elisabeth, featured in Cyril Davenport’s English Embroidered Book-bindings (1899) — Source. 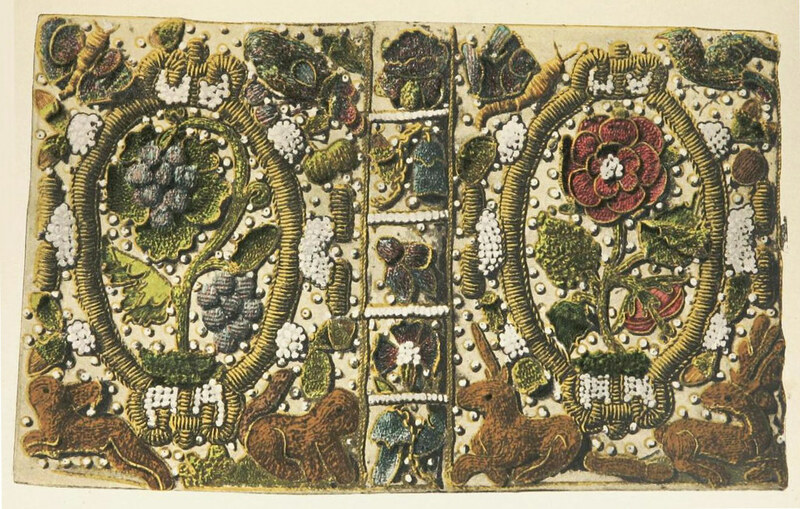 The most significant examples of embroidered books emerged from the anti-industrial Arts and Craft Movement, which flourished in Britain between 1888 and 1920. Exemplified by William Morris, whose Kelmscott Press is briefly mentioned in Pollard’s introduction to The English Bookman’s Library as the preeminent contemporary example of fine book making in England, the Arts and Crafts Movement sought to elevate the materials and work of craftsmen — and craftswomen. Morris’ daughter May was an influential and important designer and embroiderer who exhibited, taught, and wrote about embroidery extensively. Though only twenty-three, she took over management of the embroidery division of her father’s company in 1885 and ran it until his death in 1896. One of May Morris’ contributions to the first Arts and Crafts Exhibition Society, held in London in 1888, was an embroidered book cover. 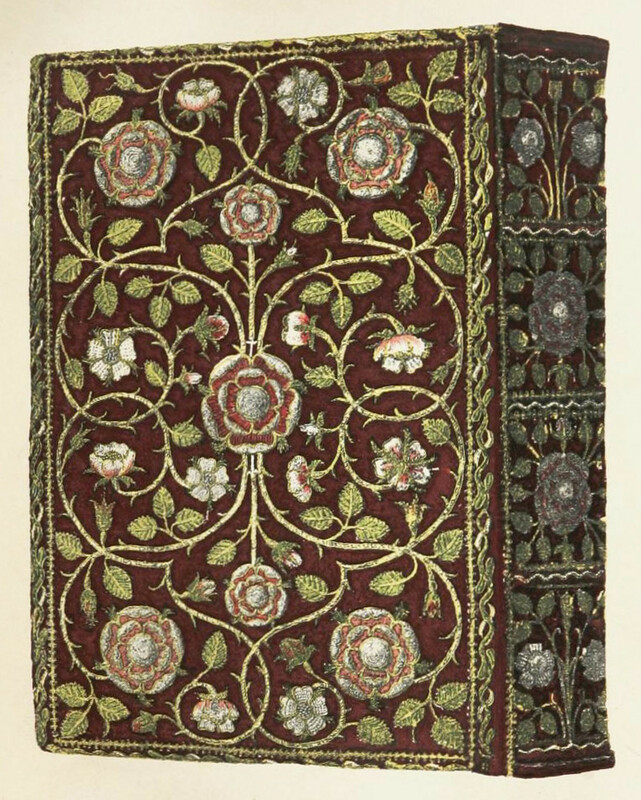 In the catalog it is described as a “silk-embroidered cover for ‘Love is Enough’”, a book of her father’s poetry.10 Morris embroidered at least a few other book covers. The University of Manchester has a copy of The Tale of King Florus and Fair Jehane bound by May Morris in orange silk with a design of two birds under a tree. Morris, like her father and Davenport, was particularly interested in looking to earlier periods for inspiration. In Decorative Needlework (1893), she describes the medieval and early modern periods as the height of artistic embroidery. Her work, too, is motivated by a desire to revitalize a patriotic tradition. The embroidered book offers an engagement with aesthetic and literary history: the embroidered cover, worked by hand, becomes a literal interface between craft and the text. The Victorians saw a return to intimate connections between individual hands and books as an antidote to the emerging mass media, in a way that resonates with our own twenty-first century sensibilities. Referring to some of the same early modern examples enshrined in print a few years later by Davenport, the author of an article in Cassell’s Family Magazine for 1894 laments that “Books were treasures in those times; now they are so innumerable that they are tossed about anyhow by half of their owners.”11 Creating beautiful embroidered covers, the article suggests, can reassuringly set apart a favorite volume, and show books the attention they deserve. As collections of innumerable texts can be easily stored and retrieved on digital devices, we too have to reconsider how and why we value books. As the history of book-embroidery makes visible, craft has a great deal of generative potential for reimagining that relationship. Jessica Roberson is an Ahmanson-Getty Postdoctoral Fellow with the William Andrews Clark Memorial Library and the Center for 17th- and 18th-Century Studies at the University of California, Los Angeles. She writes and publishes on poetry, book history, and literary material culture in the long 19th century, on topics ranging from Houdini’s marginalia to souvenirs taken from poet’s graves. She is currently working on a book that examines the impact of Romantic science and literature on representations of media life cycles and the intellectual history of “the death of the book”. 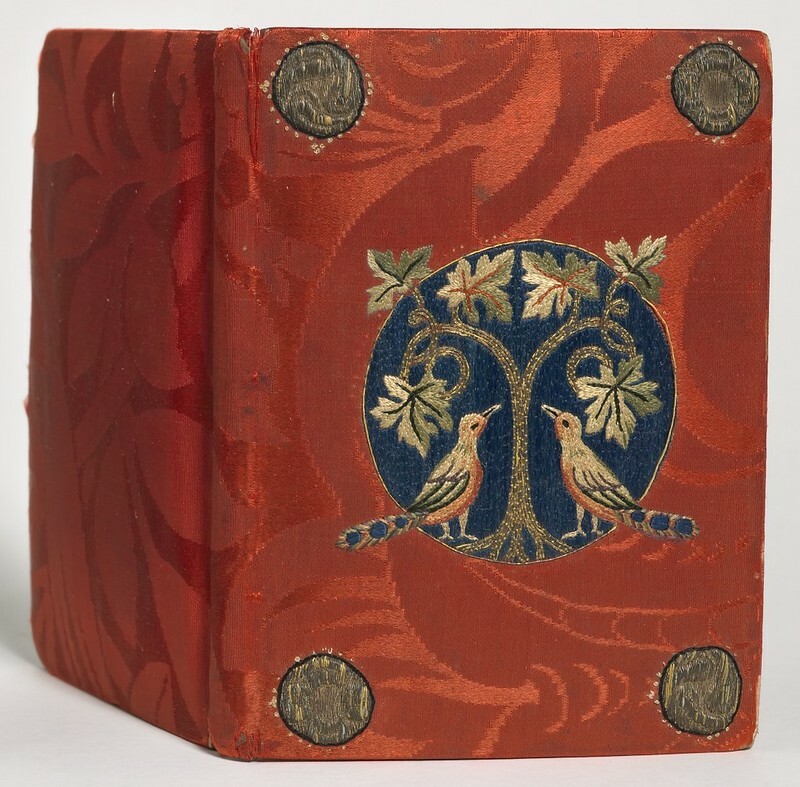 English Embroidered Book-bindings, by Cyril Davenport. A History of the Art of Bookbinding: With Some Account of the Books of the Ancients (1894), by William Brassington. Decorative Needlework (1893), by May Morris. Beautifully illustrated re-evaluation of the reciprocal relationship between women and embroidery which has brought stitchery out from the private world of female domesticity into the fine arts, creating a major breakthrough in art history and criticism, and fostering the emergence of today’s dynamic and expanding crafts movements. Supplementing close readings with a sensitive reconstruction of how Victorians thought and felt about books, Price offers a new model for integrating literary theory with cultural history. This book reshapes our understanding of the interplay between words and objects in the nineteenth century and beyond.